Dehradun, a city situated in the newly formed state of Uttarakhand. Dehradun is one of the oldest cities in India its reference is even in the written that dates back to 250 BC even the great king Ashoka's inscriptions can be found outside the city. There are 14 edicts carved on a rock and the site where three horses were sacrificed by Raja Shilvarma of the Vrisheri dynasty. Large bricks with writing on them are laid out in the shape of a huge bird with a fire altar in the middle. In the ancient Vedic times, the Garhwal Mandal, of which Dehradun is a part, was known as the Kedar Khand. Legend has it that Guru Dronacharaya, a Brahmin teacher of warfare, found Dehradun a place that was fit for meditation & worship and therefore, the valley of Doon was christened Drona Ashram, which means "The Abode of Drona". Perhaps that is why Indian army trains its finest cadets in the Indian Military Academy that is situated in this part of the state. Dehradun has always been famous for various educational institutes that are present in the city. Its close proximity from the bustling city of Delhi and another tourist attraction Mussoorie adds to the attraction of the city. Its mild climate and the list of endless places to visit in the city makes it an important tourist attraction. The Tapkeshwar Mahadev temple is an age-old temple, and it has a rustic charm to it. This pretty cave temple is located in the cantonment area of Garhi. It is situated near a river, which adds to the beauty of the temple. The cave which houses the temple is called as Drona Cave. The temple is dedicated to Lord Shiva, and is thronged by his ardent devotees. 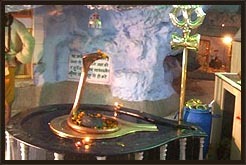 You can see water trickling on the Shivling, owing to which the temple has been christened Tapkeshwar. The unique structural design of the temple is very appealing to the eyes. An interesting story revolves around the existence of this temple. It is believed that this temple dates back to the era of Mahabharata. Common faith follows that milk appeared from this cave owing to the powers of Lord Shiva. Ashwathama needed this milk and it was due to Lord Shiva that the milk appeared. Ashwathama was the child of Guru Dronacharya. This mythical stories revolving around it has endowed the temple with a hallowed aura. 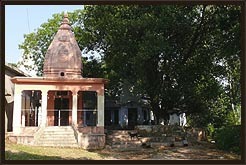 The Tapkeshwar Mahadev temple houses two shivlingas. Both these shivlingas are not man made and have come into existence naturally. A festival is held here every year. This festival is known as Tapkeshwar fair. It takes place at Shivratri and has great religious significance. The festival is celebrated with great fervor and revelry. The temple can be reached by air, road and rail. It is located at a distance of about 5.5 km from the heart of the city. So make sure that you visit the Tapkeshwar Mahadev temple and soak in the holy and sacred atmosphere that the environment of the temple exudes. 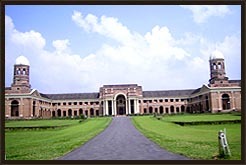 The Forest Research Institute came into existence in the year 1906. It is situated on the Kaulagarh road in the city. This age old institute is responsible for propagating and developing forestry and related activities. It is one of the largest institutes in the country. It is the place where all the Indian Forest officers are imparted training under the guidance of he experts. Almost all of the forest officers are tutored here and are products of this superb institute. This edifice spreads over a huge area and the total area is believed to be around 450 hectares. The institute also offers superb views owing to the Himalayan ranges extending behind. The edifice has been built using the Greco- Roman and the Colonial styles of structural design. The institute houses a variety of other structures like the library, laboratories and other interesting things. All of these are very advanced and of excellent quality. The museums situated in the Forest Research Institute are a favourite among all the tourists. These are very exciting and a delight to the eye. There are six museums in all and each of these is unique and different. You will find various types of wood, species of animals and birds in addition to the mélange of botanical treasures and interesting insects. The museums prove to be very informative and are the perfect places for all nature lovers. Some wild animals can also be seen here. The Botanical museum is surely not worth missing. The Forest Research Institute is very easily accessible. The Clock Tower is a popular tourist attraction of the city. 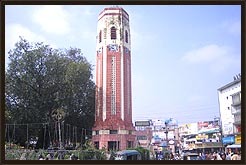 The institute is located close to this Clock Tower near the Dehradun- Chakrata road. It is trying its best to develop all the spheres related to forestry and preserve our natural wealth. So do make it a point to visit this institute which will make you more aware about issues like conservation. Sahastradhara is also called as the thousand fold spring. The cascade here is definitely worth watching. The water descends from an altitude of about 9 meters. The gushing water carries lime specks along with it and this lime can be seen near the rocks. The frequent addition of these lime specks has resulted into the formation of a bulge or a shelf like structure. Over the years, the structure has taken the shape of a cave. This cave attracts scores of tourists who are induced towards it by its antique charm and beauty. Here you will also find a sulphur spring. This sulphur spring is believed to have some healing or curative properties. The tourists take dips in this water. 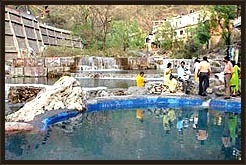 Common faith subscribes that the water from these sulphur springs heals any skin diseases or ailments. In addition to healing the skin diseases, the water also has other therapeutic characteristics. This fact also draws numerous tourists towards this place. The Baldi River can also be seen in the vicinity. This river is an ideal place for outings and picnics with your loved ones. The serene and lovely Sahastradhara will surely prove to be a rejuvenating and relaxing experience. It is easily accessible. Sahastradhara is located at a distance of about 14 km from the city of Dehradun. You can avail of the buses starting form Dehradun which would take you up to Sahastradhara. Make sure you head for this beautiful place and make your Dehradun tour an unforgettable experience. 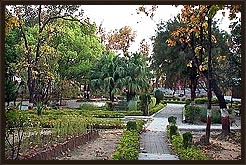 The Malsi Deer Park is located at the base of the Shivalik mountains. This park is a small zoological park, which is very popular. The beautiful surroundings of the park make it even more attractive. It is a great place to enjoy quality time with your loved ones. This deer park also houses a park specially built for children. This children's park consists of various joy rides, swings and merry go rounds. The children simply love this park and it is their favourite haunt every evening. 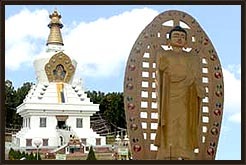 Buddhist Temple at Clement Town in Dehradun is attracting tourists from all over the country due to its matchless wall paintings in pure gold colour, meticulously depicting in events in the life of Lord Buddha. This structure, which was built in 1965, is a replica of original monastery in Tibet. It was created under one of the four schools of Tibetan religion named 'Nyingma', while other three being Kagyu, Sakya and Geluk. Tapovan is a very sacred place which echoes spirituality. The air here is filled with a spirit of devotion and sanctity. It is enveloped by lush green surroundings, which have a rejuvenating effect on the jaded nerves. It is situated close to the river Ganga which adds to the holiness of the place. It is located in the vicinity of the Raipur/Sahastradhara crossing. This place assumes importance owing to a story revolving around its existence. It is believed that Guru Dronacharya underwent penitence here. Guru Dronacharya was the Guru of the Kauravas and the Pandavas in the epic Mahabharata. This myth leads to added interest and curiosity among the tourists and the religious people having a keen interest in mythology.